Arranged by Clifton J. Noble Jr. Performance Music Ensemble; Single Titles. 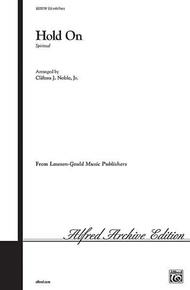 Alfred Archive Edition: Lawson-Gould Music Publishers. Sacred; Spiritual. Choral Octavo. 12 pages. Alfred Music #00-LG70719. Published by Alfred Music (AP.LG70719). April 11, 2014 "Hold On" is fantastic !
. Wonderful inpsiration for women, young, middle, or old! Men, too... "Hold On" rocks and rolls us, but keeps us hanging on. I've never seen anyone that did not love this piece! Worth stretching your group for it.
. This song will take you on a crazy ride.